Newspaper report about the L.M.S. Salvage Coach which visited Lytham St.Annes in August 1942. Exhibition at St. Annes opened by Mayor. THE L.M.S. Railway Company's salvage exhibition was on view at St. Annes on Wednesday and was visited by a large number of people. It comprised a coach showing materials that can be made from salvage, and another coach containing a film unit. The object of the exhibition is to stimulate the salvage effort among railway men and the public. The 34-years-old coach was damaged in an air raid and was scheduled for breaking up, but was salvaged to house the exhibition and all the materials in the exhibition are also salvaged. The walls are lined with balloon fabric salvaged from balloons damaged whilst guarding our towns and cities. The cast-iron letters used as slogans were made from the names of railway stations removed in 1940. The exhibits show how salvage is turned into serviceable materials used in the war effort. Mr. Ashton Davies, C.V.O., 0.B.E., vice-president of the L.M.S., who introduced the Mayor, said that the coach was symbolic of the great part being played by the L.M.S. in salvage. The L.M.S., actually, were pioneers in salvage. In the last six months alone they had salvaged 2,375 tons of metal, 2,752 tons of paper, and 178,816 bottles. Frequently the necks of bottles were broken, but they were turning them into tumblers. They had put more than a hundred million sheets of paper back into service during the same period. “We want to utilise this coach," he continued. “to encourage our own effort and introduce the public to a great scheme. Waste is unpatriotic." The Mayor, in opening the exhibition, said he wanted, as Mayor, to express his great appreciation of what the L.M.S. had done for this Borough both before and since its incorporation. That indebtedness to the Railway Company had been brought about by the very good offices of their real friend, Mr. Ashton Davies. The public knew far too little of the part being played by the L.M.S. in the national effort. He could assure them that that effort had been colossal. Indeed, if ever the story of the part played by the L.M.S. came to be published in full it would be found to be not merely a fascinating story but an amazing one. That effort had been made in spite of many obstacles and difficulties which at times must have seemed to be almost insuperable. Those who knew Mr. Ashton Davies, however, knew that he, like other great leaders, did not recognise the word impossible. Everybody should see that exhibition, and those who did see it would realise the effort being made by one of the greatest concerns in the country. They should also, at the same time, realise that even the smallest and meanest article might be used to further the country's war effort. The Mayor expressed his thanks to Mr. Ashton Davies and the L.M.S. for the opportunity of seeing the exhibition and also for their contribution to the war effort. The Mayor was supported by the Mayoress, Coun. 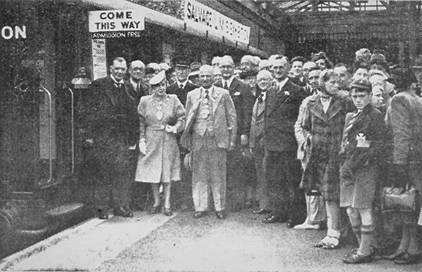 and Mrs. J. Kay (Deputy Mayor and Deputy Mayoress), the Town Clerk (Mr. Walter Heap), Mrs. Heap and many members of the Council.